Jim Joyce didn’t even have to think. Best known for a blown call at first base in 2010 that cost Detroit’s Armando Galarraga a perfect game, Joyce made the controversial call that gave the St. Louis Cardinals a 5-4 win over the Boston Red Sox on Saturday night and a 2-1 World Series lead. Boston third baseman Will Middlebrooks was flat on his stomach when he raised both legs and tripped up Allen Craig in the ninth inning. Joyce immediately called obstruction, making it immaterial that left fielder Daniel Nava retrieved catcher Jarrod Saltalamacchia’s errant throw and got the ball home in time for a tag. 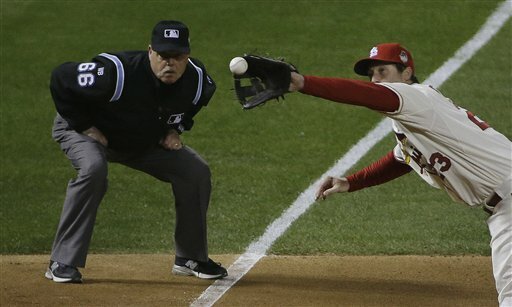 In Joyce’s view, Middlebrooks would have been called for obstruction even if he hadn’t raised his legs. Joyce, a 58-year-old veteran of a quarter-century in the major leagues, made the right decision, according to Major League Baseball officials and Hirschbeck. “Immediately after we got off the field into our locker room, we congratulated Jim and said, `Great call,'” the crew chief explained. “We’re trained to look for these things. It’s out of the ordinary, but when it happens, and it’s the World Series, you expect to get it right.